Hot water that never runs out. The Rheem 20L Gas Continuous Flow water heater is a compact, medium capacity model that's ideal for homes with limited space, small to medium sized apartments and townhouses. For all other installations, the warranty period is 1 Year parts and labour on Heat Exchanger and other components. See the Rheem warranty set out in the Owner's Guide and Installations Instructions. Ready to buy a Rheem? For help to make the right choice, access our network of Rheem Approved Plumbers and Stockists. My Rheem Heat Pump is showing a fault code. Please see the Owner Guide for your Heat Pump model. 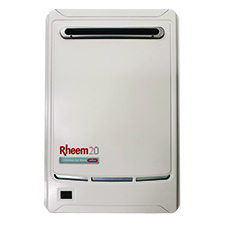 What maintenance can I do on my Rheem hot water system or appliance? Please only conduct the basic maintenance specified for owners in your Owner’s Guide. All other maintenance must be made by an approved plumber. To find your local Rheem Plumber, contact us or call Rheem on 1300 556 036. Why has my water heater’s pilot light gone out? Please see the Owner Guide for your Storage Water Heater model and our gas relighting videos. My hot water system leaks water, or water leaks from the relief valve. Please see the Owner Guide for your Storage Water Heater model. My water is not hot enough, how do I turn up the temperature? The water temperature may be lower than usual due to heavy hot water usage. Also, this problem could be due to faulty tempering valve that is excessively cooling your hot water. Your local approved Plumber can test your system and replace the valve if necessary. To find your local Rheem Plumber, contact us or call Rheem on 1300 556 036. Compact and energy efficient with a minimum 6 star energy rating. 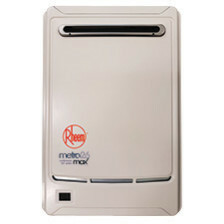 Rheem Metro 26L Gas Continuous Flow Builder models are the right choice for your projects.